Rolling, rolling, rolling …. we are rolling along with another entry in our new series “Spring Texas Neighborhoods”. In which, each week we provide a snapshot of a new neighborhood. Hopefully providing you with a “feel” for what it is like to call a particular neighborhood or subdivision “Home”. By the end of the weekly series, we will have doubled our quantity of profiled Neighborhoods. Don’t worry if you miss a week because the full profile (not just the snapshot) with additional photos of the Neighborhood will be located in the Spring Texas Neighborhoods section of our blogsite for you to view at anytime. This week, we take a look at the Huntwick subdivision. 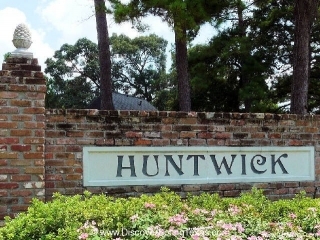 Since Huntwick is not located in Spring Texas it is not considered a true Spring Texas Neighborhood. But it is located just South of Spring Texas Neighborhoods, so we decided to profile the neighborhood anyway. Besides we like Huntwick and think it has a lot to offer potential home buyers. 832 Custom Tudors, English, and Traditional style homes on generous lot sizes comprise the wooded, established subdivision of Huntwick. A gas lamp post adorns every yard providing a nightly calming gentle glow across the neighborhood. The majority of the homes were built in the 1970s, the median square footage checks in at 3,100, with the homes price ranges running from $155,000 to $550,000. The subdivision’s amenities include tennis courts, playground area, picnic tables, club house, basketball court, swimming pool and 2 parks with one of them being a dog park. Residents of Huntwick love their close proximity to upscale shopping and dining at the Champions Village Shopping Center. Whether they desire for Italian for Seafood or the latest best seller book or the latest “in” jeans, Huntwick residents can quickly satisfy their desires at the Champions Village Shopping Center that is located at the entrance to their subdivision. View the complete profile of the Huntwick subdivision, additional photos and its homes for sale.